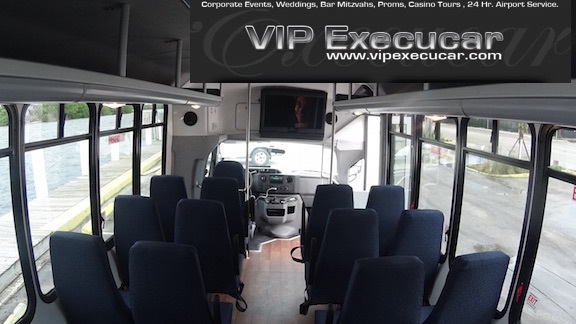 Luxury Bus Miami to Orlando| Executive Car Service | Group Travel Florida,Vipexecucar.com,Chauffeur Service. Luxury Limo Fleet: Our Executive Fleet provides distinctive, high quality, professional limousine and executive car service at competitive rates. Whether you need limousine for wedding, bachelor we are 24/7 open in South Florida (Dade, Broward, Palm Beach and Lee counties).We are a full service limo and luxury car service company with an emphasis on customer service. Terms and Conditions may be subjet to change, price changes seasonally. Please check this website periodically. Would you like direct transportation from Miami International Airport to Disney World Orlando? Do you like your Orlando to Miami limo service to be on time, waiting for you the moment you step off the Airport? 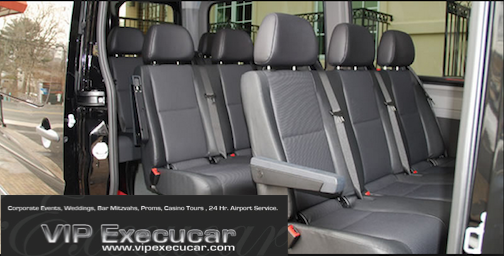 Mini Van : Check our great selection of passenger Vans for 12 passengers from Miami VIP EXECUCAR Limo. Enjoy you next trip out in Miami in a luxury Stretch SUV 6,15 passenger Limo $95 with the minimum of 3 hours..
Mercedes-Benz of Miami has new Mercedes Benz sprinter Limousine Van available for rent at our Florida Home. Mercedes-Benz of Miami Beach has new Mercedes-Benz Sprinter Limousine Vans available for rent and to enjoy the Luxury Travel Experience with Vip Execucar in Miami. 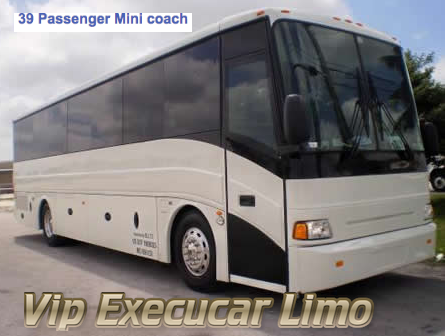 Charter Buses of Coral Gables has new Mini Bus Deluxe Bus Charter for 24 paasengers, available for rent and to enjoy the Luxury Travel Experience with Vip Execucar in Coral Gables. 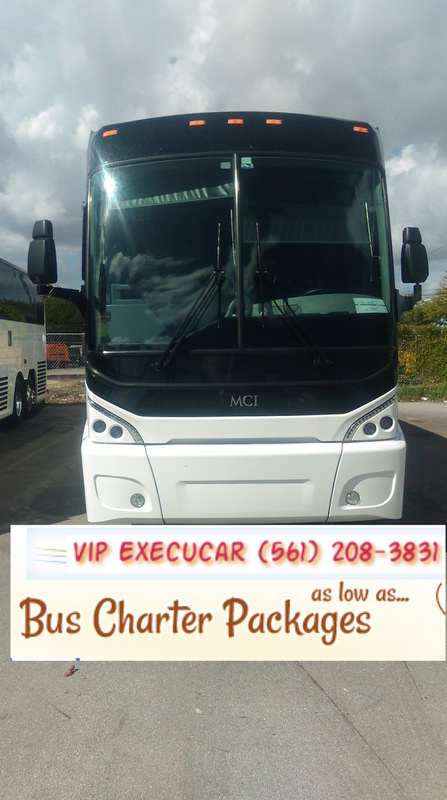 Providing best in coach bus & Tour Charter Bus rental in Coral Gables, Coconut Grove, Aventura, Palm Beach, Weston,Tamarac,Sunrise,Perrine,Kendall , FLL Lauderdale, Miami, Kissimmee and the USA. Bus Rental Rates Palm Beach/FT.Pierce, Florida, Door to Door Transportation. Bus Charter & Rental Campany - For groups 20-30 passengers, renting our Mini Bus Charter Rates $105 Hourly Fort Lauderdale,Boca Raton/Miami FL. is an execellent deal. 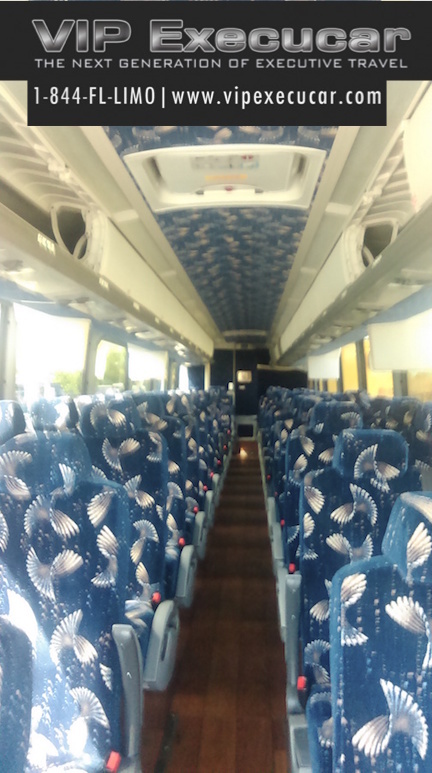 Inside Charter Bus 39 Passengers. Our Mini-Bus Charter offers ample leg room, offers wide doors for easy access and is available for rent in Altamonte Springs,Miami and Port Canaveral, Fl. Providing Charter Bus limo to West palm Beach, Fort Lauderdale, Miami, Kissimmee and the USA. Bus Rental Rates Palm beach/FT.Pierce, Florida, Door to Door Transportation. 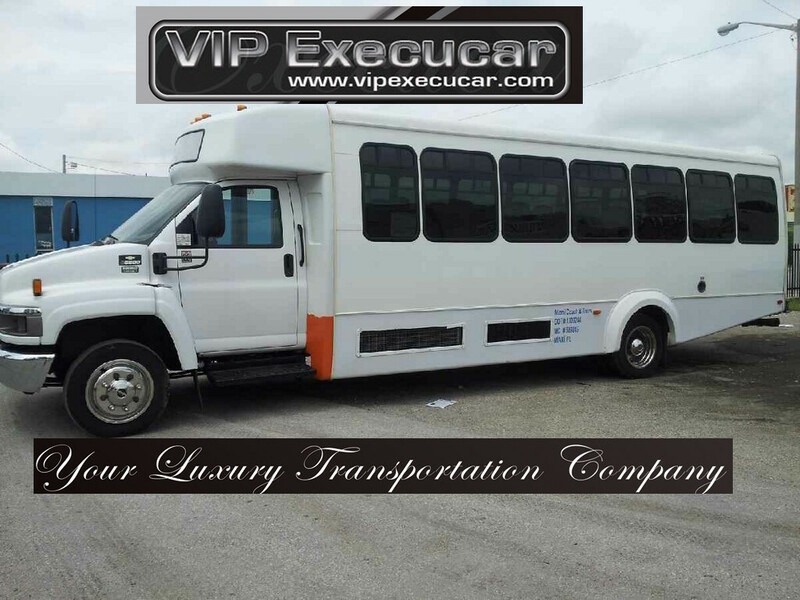 VIP EXECUCAR provides Hotels transportation, Real State charters, Corporate charters and charter bus rental in Miami/Fort Lauderdale Florida.Vip Execucar Miami VIP Transportation best Rates $105 Hourly Mini-Bus Boca Raton/West Palm Beach FL. Town Car Sedan:The king of the Luxury Lincoln sedans limo service 4-door is a full-size luxury executive sedan. Comfortably seating 2-3 passengers with normal luggage. Sprinter Limousine: The king of the Mercedes Bemz Sprinter Passenger Van, seats 10/12 Passengers in luxurious interior, High Powered Custom Sound Systems. Miami provides elegant, dependable luxury transportation/from Miami area airports to Orlando Bus Shuttle Airport. Lincoln Stretch Limo: Stretch Limousine (Limo) chasis has been extended offers a luxurious interior with 2-LCD TVS, premium DVD, CD, AM/FM, with surround fiber optic, Bar,Ipod connection and a mirrored ceiling. 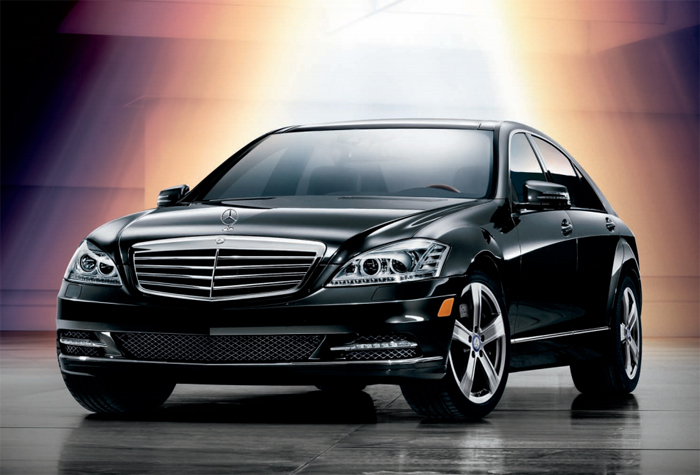 Mercedes Benz Limo Service: The Mercedes Benz S550 Limo is the flagship of the Mercedes-Benz S Class car service. It has luxurious premium full-grain leather, Confort, Style, Prestige it is known for exceptional safety, you can Book a luxury Mercedes Transportation in Orlando, Miami for business airport weddings and prom. The Volvo SUV Limo is the most luxurious and largest four-door vehicle, View our fleet of late model sport utility vehicle and is available when you call us. 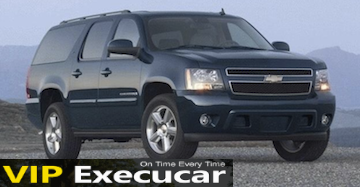 Chevrolet Suburban SUV: Our 2013 8 passenger SUV Limo offers comfort, heated second road seating. This sports utility vehicle is perfect to carry your precious luggages around Private & Executive Airport, Boca Raton Executive & Miami Town. 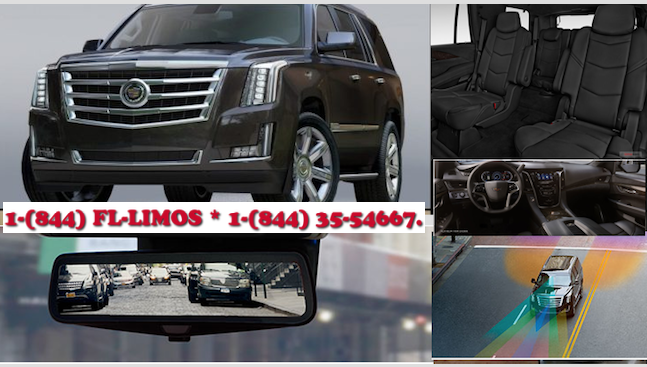 Cadillac Escalade Limo: The king of the SUV family for years, spacious luxury interior and hansone exterior. 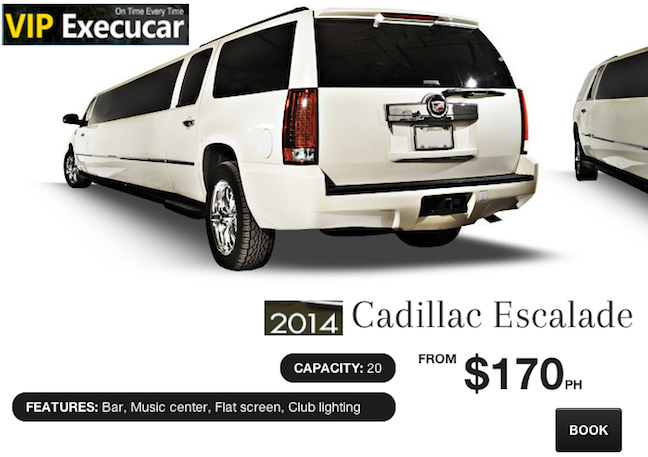 Cadillac Escalate CEO-Class Limousine Service is perfect for bachelerotte parties, proms, night out on town and weddings. How much does it cost to rent a Cadillac Escalade per hour? Rates: $125.00 Cadillac Escalade per hour (2018 Model) 6 passengers. Escalade & ESV. Hourly STARTING AT. $125 per hour 3 hours minimum. Hummer Killer Limo: Our fleet includes Limo Bus, Executive driver,30 passenger Hummer limos, Mercedes, Chevy Suburban 7 passengers, Lincoln & Limousine Rentals - Stretch Limo, Party Bus, Miami Hummer Killer (Seats up to 30 passengers). It has luxurious premium full-grain leather, Confort, Style, Prestige it is known for exceptional safety, Book Mercedes Limo Service by phone. 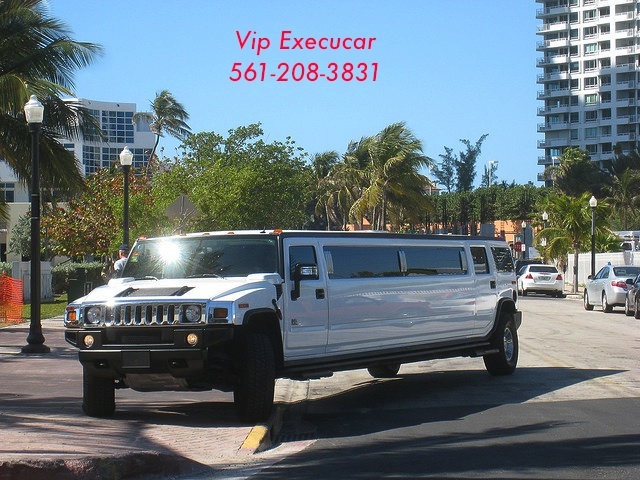 We have the larger Hummer Limousine in South Florida (West Palm Beach, Fort Lauderdale, Miami, Naples and Key West FL). Our mini bus rentals provide safe group transportation around Orlando Fl. Our Charter Bus service is available For Orlando Area and throughout Walt Disney World. If your travel needs a vehicle that can accommodate 10-15 passengers comfortably with luggage, consider a custom Mercedes Benz Sprinter 170 WB van. Whether you need a Mini Bus, Party Bus for a Bachelor Party, Corporate Events, Special Events, or just a night on the town, our 12-14-20-24-30 passenger Mini Bus will make your party a success! Executive Car Service: Executive members of the Vip Execucar Corporate Travel Awards program receive discounts up to 10% off luxury car rental rates with a corporate account. For Airport Executive Transportation Service, Boca Raton transportation and executive Town car service in Boca Raton, West Palm Beach Florida , Vip-Execucar Sedan Limo is your best source for Fort Lauderdale, Boca Raton and West Palm Beach transfers to/from West Palm Beach, Boca Raton and Miami. 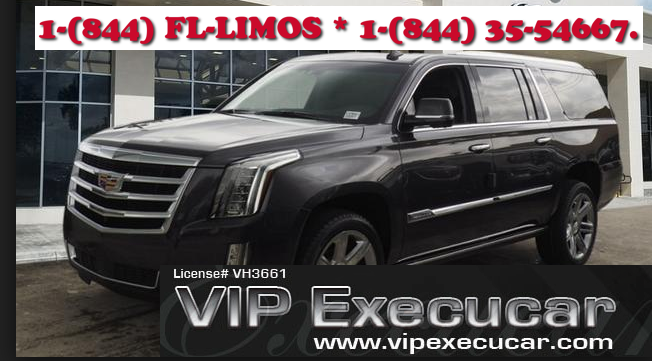 Vip-Execucar offers executive car, Key West Executive Limo, Key West Limos,Tampa Limousine,Luxurious Limo in Key West, IslaMorada Luxury Vehicles, Luxury Town Car, 2013 New SUV Limo, Limousine rental in Weston, in the South Florida regions that includes all this locations , West Palm Beach, Boca Raton,Palm Beach, Fort Lauderdale, Ocean Reef FL, Marathon Executive Club,Key West, Naples,Aventura and Miami Bus rental. 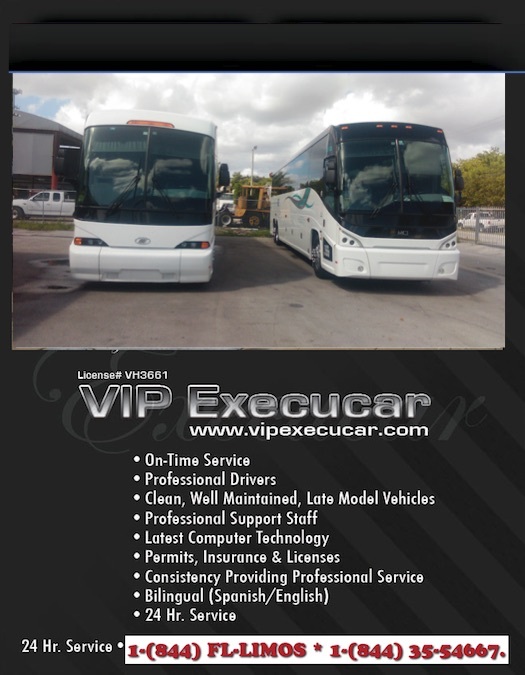 Fort Lauderdale bus transportation services at Vip-Execucar (561) 208-3831. Years of luxuries Executive Bus Transportation experience in Fort Lauderdale. Find Saving and Where you are going with a SUV Limo hire in West Palm Beach , if you believe tha the limo price that the quote you is out of your reach Limo in Boca Raton you are in the wrong limo compay; Contact us today we are conveniently located only few miles from Orlando Executive Airport (OEA),to get a cheap Party Bus FREE Quote, Profesional Car service or any Airport Transportation service. 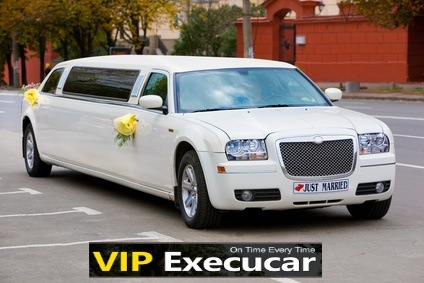 VIP Execucar, LLC is a family-owned operated limousine business since 1999 in West Palm Beach Florida dedicated to making your special occasion truly unique and memorable. No mater what your business car rental need, Vip Execucar Executive Limousine Rent A Car has a solution for all your Fort Lauderdale-Hollywood Airport shuttle and executive car Service provides the community with local and national traveling services via luxury car and party bus limo packages. Get information on our new executive sedan including rebates, chauffeurs, stretch SUV's,pictures, pricing and more. 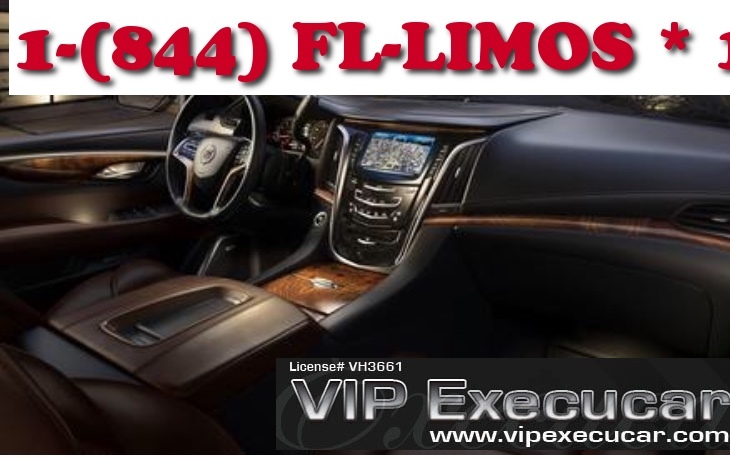 Find the rigth executive luxury limo sedan in Pinecrest, Fl, Palm beach, west Palm, Juno Beach. 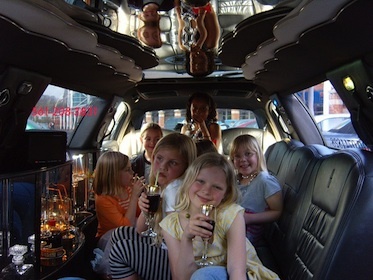 Compare prices for Pinecrest party bus, Hummer and Luxury limos. 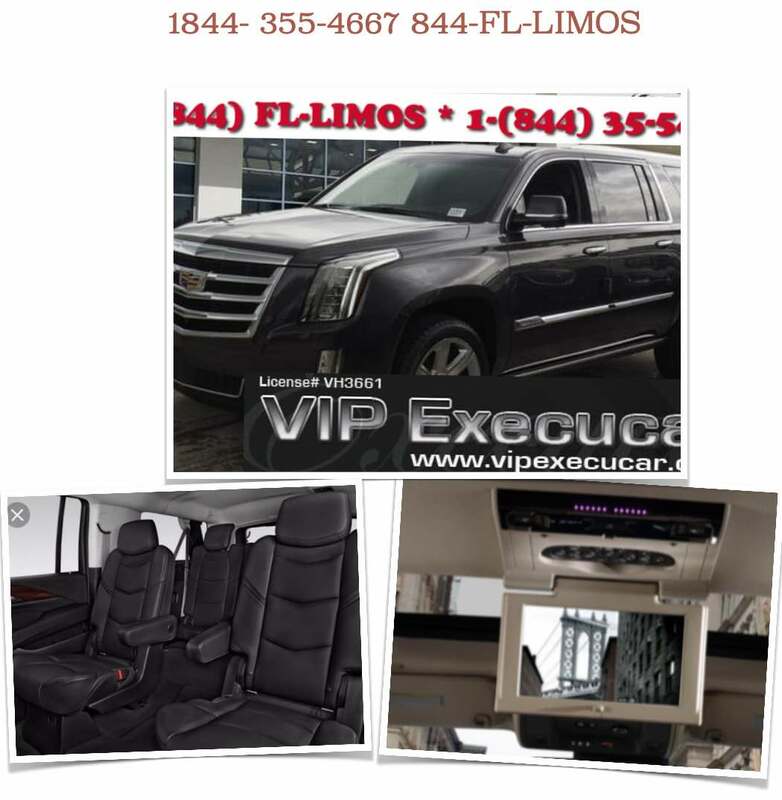 VipExecucar provide professional West Palm Beach Limo service, Boynton Beach Car Sevice and Executive airport service, Hourly limo rates, Luxury SUV's Limo,Parkland Party Bus, Wellington Hummer Limo, Deerfield Beach Black car service as well as Airport transportation & Van Shuttle transportation in the South Florida region. Limo service from Palm Beach To Miami offers regular services with no stops West Palm Beach airport car services daily to Miami International, Fort Lauderdale Executive Airport and Palm Beach airport, we transport cruise passenger to and from Port Of Everglades. Search Brickell Limo on Brickell Avenue ground transportation listing by professional Chauffeured, couteous, friendly and safe and includes SUVs, charter buses, sedans, towncars. We can help you find the best luxury transportation service & Corporate Car Limousine Service in the Naples area, Marco Island, Cape Coral and Fort Myers Florida. Stuart Limousines: Our Stuart Fl limousine travel from the Stuart Service area to Singer Island to Port Sant Lucie. We continue to offer top Singer Island Hummer Limo, Stuard Party Bus, Limo from Executive Airport to Stuart, Lowest rates limo for van Shuttle, Fort Pierce Fl 34982 to Palm Beach Fl 33480 and group travel for tourist. and West Palm Beach with Vip Execucar LincolnTown Car. The official Private car service for International Airport, Fort Lauderdale International airport also offers Black Car, Private Van and SUVs service in Boca Raton and Fort Lauderdale. Fort Lauderdale International airport TO/FROM Boca Raton 4 Passenger $65/$70, We GUARANTEE the best price. Vip Execucar Chauffeur Limousine Car Service. Personalized Chauffeur & Limousine car on-time service in South Florida, our chauffeured ground transportation ara available 24/7 to drive you anywhere, Miami, Fort Lauderdale, West Palm Beach, Weston and Key West. Chauffeur Services Boca Raton, Fort Lauderdale and Miami | Driver Miami,Car Hire Driver,Car hire Service Palm Beach. We have ultimate and updated town cars for airport,Chauffeur with CDL A. Find limos, SUV's,Hummer,buses, chauffeurs, Hummer killer and more in Weston, Coral Gables and Coconut Grove Florida.Executive Car Services provides comfortable, prompt, and professional car services to West Palm Beach and its surrounding areas. 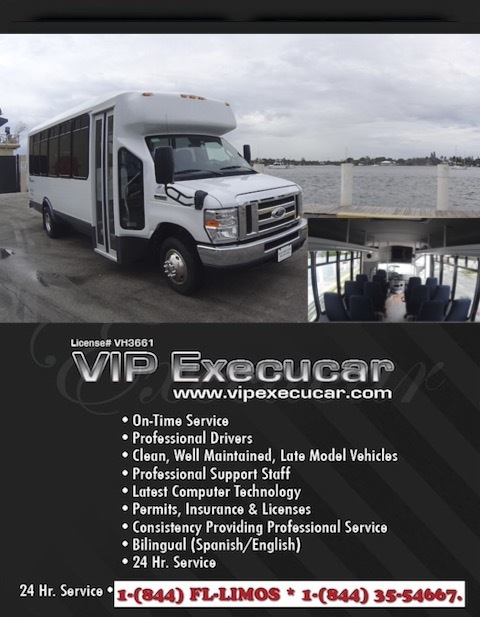 Vip-Execucar Transportation offers customized cruise packages, park tickets, discounted theme parks tickets, hotel reservations, shopping tours, event packages and many years of luxury transportation experience. Our commitment is to provide the ultimate transportation experience and make sure a new client becomes a permanent one. 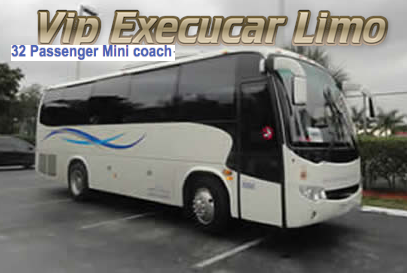 Traveling by Motor Coach is affordable by Vip-Execucar from/to airports in South Florida with service to PBI, MIA, FLL, EYW, MPB and OPF. We provide on time Palm Beach International car service to Miami International Airport, Fort Lauderdale airport from all Palm Beach Hotels. Our black town car service to Boca Raton executive and Signature is available 24/7.Palm Beach chauffeur offers one of the fines chauffeured Luxury Town car service for airport , or local transport. Vip-Execucar® transportation provides outstanding class Luxury Tour Bus, Limousine service at competitive prices for West Palm Beach, Boca Raton, Miami and Key West. We currently offer discounted rates for airport, quinceañeras prom, bachelor party,bachelorette party, birthday party or anniversary for Boca Raton, Fort Lauderdale, Broward County, Miami, Dade County,Palm Beach, Monroe County and Key West. 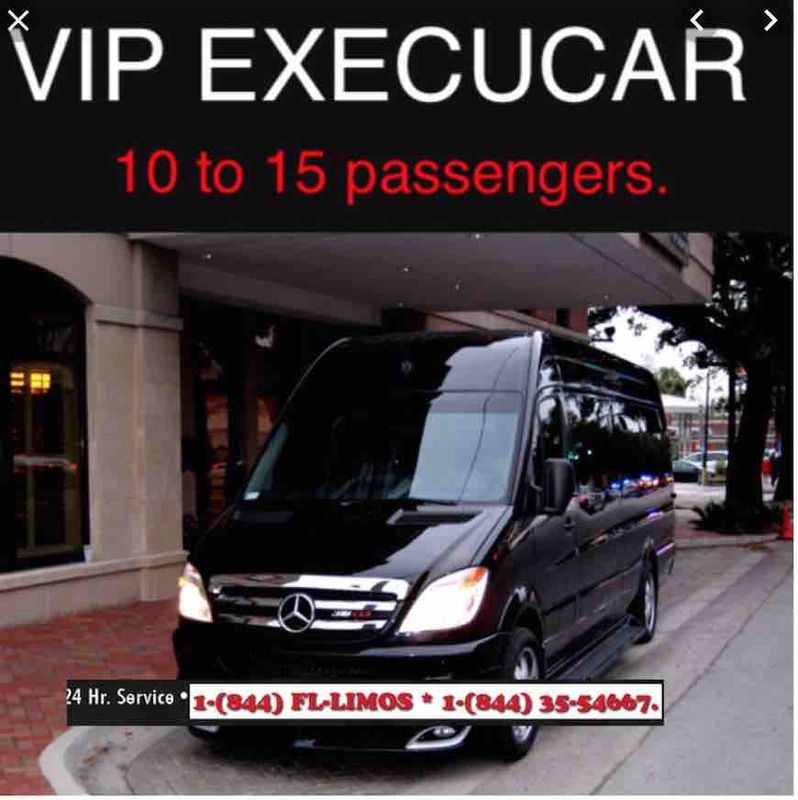 When it comes to Tour Bus, Luxury car service, Airport Limousine Bus, car services or airport transportation, Vip-Execucar Transportation is the most preferred choice for various corporate and private sectors in Fort Lauderdale; Miami;West Palm Beach; Boca Raton, Key West and South Florida. Looking for Key West Airport transportation; Key Largo and Isla Morada you found Vip-Execucar Car Service Transportation company for all your travel needs.We are cost-effective Airport transportation company that provides quality Key West airport transportation.Hire company that offers its clients new Buses ,Executive Town car, see South Florida in style in our gorgeous new luxury bus, town car NKT or Limousine NKT. West Palm Beach Airport Transportation: Executive car, Towncar and SUV Limousine provides professionally chauffeured sedans, airport, comfortable SUV's, Limousines and Motor Coaches at exceptionally rates. Serving Palm Beach ,Miami, Coco Plum, Kendall,Coral Gables,Boca Raton,Key Biscayne, Bal Harbour, Star Island, Fisher Island,Lake Worth,Kings Point,Weston, ParkLand,Royal Palm Beach, Miami,Manhattan New York City, Palm Springs, Naples,Lantana,Lake Park,Key West and Vero Beach with our luxury Black Town Casr and SUV. Vipexecucar Executive TOWNCAR West Palm Beach can respond to your PBI airport transportation promptly, 24/7 open. Jupiter TOWN CAR Executive car and SUV Limo car service is the perfect choice for shuttles, weddings, business or pleasure. Fort Lauderdale Private Town car: is here for all of your Fort Lauderdale private car service needs. Whether you need a ride to FLL Airport, MIA Airport or PBI Airport, or want to enjoy dinner in Boca Raton and a Miami Wedding , we can provide you with a new Town Car, luxury Town car , New SUV Limo,limousine and professional chauffeur to take you where you want to go. We are the first choice in Fort Lauderdale car service, Limousine service and rentals. 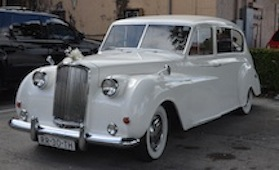 Flat Rates Car Service from Jupiter to West Palm Beach airport or any airport in South Florida, ride in style with our Town-car to Fort Lauderdale Wedding Limos, our Ft Lauderdale limousine will take you from you home, to the wedding and on the reception in affordable luxury car service. Boca Raton Executive SUV Limo Service Serving: Executive Sedans & Limousines offers a full fleet of Town Car, Limousines, Buses, Van and SUVs for luxury transportation at the fallowing cities: Fort Lauderdale; Miami, Stuart,Port St Lucie, Vero Beach,Orlando, Key West, Boca Raton and West Palm Beach and Airports with dependable world class car service. Boca Raton Executive car welcomes the opportunity to provide you with the finest luxury town car service. 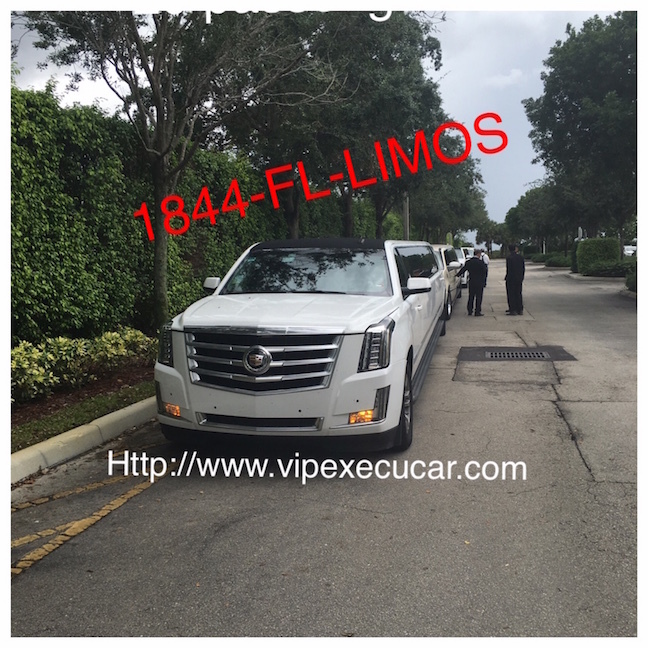 Vipexecucar Limo Service offers premier chauffeured limo and car service ground transportation , to/from Boca Raton Florida and all Airports like West Palm Beach Airport and Miami. Limousine in Fort Lauderdale are affordable when you call the leader provider for Limousines, TownCar, Executive car. We are providing reliable transportation services for personal and corporate clients.We are one of the top Fort Lauderdale Limousines companies in FLL, Miami,Boca Raton, West Palm Beach featuring Luxuries Car Service, extravagance Limo Hummers, Navigators, Lincoln Town cars, Party Bus, SUV's, town cars and stretch limousines serving the entire South Florida area. Deerfield Beach Limousine service :provides a large fleet of executive cars, limos and much more. Rent a town car, SUVs, Limousine is less expensive that a Taxi or car rental company. Pembroke Pines executive car: In Pembroke Pines you can rent a Bus, Town Car to go to a special event or occasion and Vip-Execucar, providing Exclusive Bus Car service in Miami and surrounding areas, Ft Lauderdale,Pembroke Pines,Boca Raton,Homestead,Pompano Beach and Key West FL.. Our elegant fleet of Luxury Buses, Sedans, SUVs,Van,Luxury Motor Coach is a complete, line of vehicles. 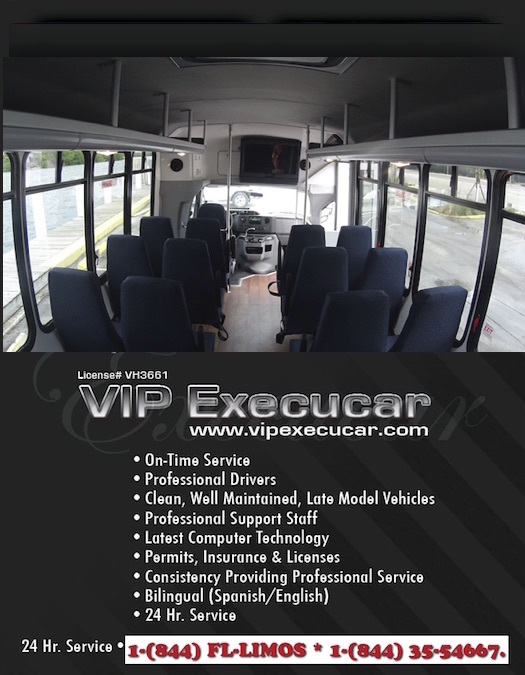 This is why Vip-Execucar Transportation has become a premier South Florida Bus Company. Customer satisfaction is our priority, look no further! Serving Fort Lauderdale, Miami and Palm Beach. We provide transportation to and from the Boca Raton Executive Airport. Corporate Car service in Opa-Locka Executive Airport. COURIER SERVICE RATES FOR PICKUP OF ENVELOPES AND DOCUMENTS FROM 9 AM TO 5 PM. THESE RATES ARE FOR PICKUPS FROM DADE, BROWARD AND PALM BEACH COUNTY. FOR SAME DAY DELIVERY ON NON HOLIDAYS FROM 9 AM-5 PM MON-FRI.
RATES DO NOT INCLUDE TAX, TOLLS, PARKING, HOLIDAY EXTRA AND AFTER HOUR EXTRA. Courier Limo Service: Our Courier Limo Fleet provide our clients with hightest quality of service at competitive rates. Whether you need a pick up and delivery in one hour or less, we are 24/7 open in South Florida (Dade-Miami, Broward-Fort Lauderdale, Palm Beach counties).